1938-1998. — 35 cm of textual records. — 296 photographs. The Imperial Order Daughters of the Empire is a Canadian Women’s organization, founded in Montreal in 1900 to promote ties with Britain and the Commonwealth. The Alphaeus Patterson Chapter of the I.O.D.E was organized in 1921, when 60 local women were part of the organization, but its formal charter was not received until 1932. The chapter was named after Alphaeus Patterson, the first MLA to be elected to the provincial government from the Grande Prairie area. Health Care: in the 1930s and 40s, the Well-Baby Clinic was a prime function—in later years fund-raising for medical equipment and providing comfort for patients became paramount; members also served families of handicapped children by working with the children and taking them on weekend camping trips. Education: during World War II the group mended library books for the new library—later this changed to purchasing large-print books and tapes. Other educational services included offereing bursaries and scholarships and supplying materials and children’s clothing to an “adopted” school. Arts: giving out awards at City and District Music Festivals and to the Western Board of Music in the name of I.O.D.E. Social Welfare: supporting Grace Children’s Home, the Child Development School; Odyssey House; making quilts and buying bedding for victims of fire; initiating health programs such as the Vial of Life; and delivering Meals on Wheels to shut-ins. To raise money for their programs, members held formal dances, silver teas, bake sales and fashion shows. From 1971 to 1987 they operated a “next to new” store. As well as being of social benefit, the thrift store was their financial mainstay for many years, allowing them to finance health, education and social programs. Like many other long-standing organizations, the I.O.D.E. lost much of its volunteer base as membership declined, and the chapter disbanded in 1997. 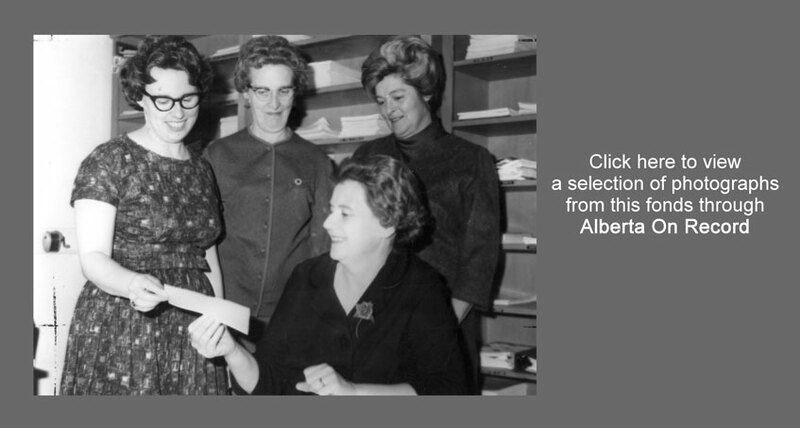 The records were preserved and donated to the Grande Prairie Regional Archives by Violet Patterson, a descendent of Alpaeus Patterson and the president of the organization when it disbanded. The fonds consists of minutes and reports of monthly, annual and zone meetings from 1938 to 1994; financial records of receipts and disbursements from 1944 to 1974; and records of the activities and membership of the organization, through paper records, photographs and news clippings from 1938-1997. Series 111.01 Minutes & Reports. — 1938-1994. — 16 cm of textual records. The series consists of the minutes of monthly and annual meetings detailing the members present at meetings, the projects and programs the group was involved with and the funds directed to those projects. Also included are annual reports and reports from zone conferences. Back to Table of Contents Series 111.02Financial Records. — 1944-1974. — 12 cm of textual records. The series consists of 18 specially designed I.O.D.E. Cash books for receipts and disbursements with the duties of a Primary Chapter Treasurer printed at the beginning of each book. The cash books contain various categories of funding and programs; for example, after World War II the programs were educational, child & family welfare, service and ex-servicemen, work in India, immigration, girl guides, navy league, and League of Nations. Back to Table of Contents Series 111.03Membership & Activities. — 1938-1998. — 7 cm of textual records. The series consists of records of membership such as membership lists, executive lists, and a biography of its founder. It also includes documents detailing the activities of the group: annual war work reports, social welfare contribution lists, reports on fund-raising events, participation certificates, thank-you letters, radio reports and newspaper clippings. There is one file on the group’s connection to British Royalty through Queen Mary’s rug in 1950 and Queen Elizabeth II’s visit in 1978. Back to Table of Contents Series 111.04Photographs. — 1950-1995. — 296 photographs. The series consists of a collection of photographs showing members of the I.O.D.E. involved in various functions and social gatherings from 1950 to 1995. Norma McNeil standing on the I.O.D.E. float in the 1950 County Fair Parade. Alex Patterson and Janet Longmate participate in the 1950 County Fair from the top of a large wedding cake float. From L to R: Ina Fee, Ella Simpson, Elsie Stashko and Isabel Day (members of the I.O.D.E.) pose in costume. Ina Fee, Isabel Day, and Ella Simpson (members of the I.O.D.E.) stand at the end of a corredor in costume. Five of the women responsible for the success of the I.O.D.E. Winter Fashion Show (L to R): Linda Field, Fran Neil, Jo Everett, Marg Longmate and Helen Stretch. Junior College librarian, Hazel Kellner, with members of the I.O.D.E. (L to R) : Vi Patterson, Frances Neil and Mardi Dobson. Dr. Henry Anderson, Hazel Kellner (librarian) with Frances Neil and Mardi Dobson of I.O.D.E. Grande Prairie’s I.O.D.E., 1970 c.
Members of the Grande Prairie I.O.D.E. including: Louise Robinson, Ann Watson, Mardi Dobson, Jessie Card, Freda Jebb, Eileen lawrence, Nora Lyster, Dolly Lynn, Laraine Rohne, Min Foster, Fran Neil, Lyda Clarkson, Marg Kloberdanz, Eva Lett, Dorothy Bondar, Vi Patterson, Marg Longmate, Kate Higginson, and Fay Bacon. The Second Appearance Shop was set up by the I.O.D.E. and was a second hand clothing store. The Second Appearance Shop was a second hand clothing store set up by the I.O.D.E. Lorraine Phnes, Mary Longmate and Fran Neil celebrate Christmas with the I.O.D.E. Children playing on a playground apparatus, donated by the I.O.D.E., at the Grace Children’s Home at Dimsdale. Alberta delegates of the National I.O.D.E. Convention at Banff Alberta. The Grande Prairie members, maked with black dotes in the fourth row, include Margaret Longmate, Jessie Card, Louise Robinson, Ella Simpson, Lynn Russell and Eva Lett. 1 photograph; colour; 3.5 x 5 in. Grande Prairie I.O.D.E. members display one of their quilts. 1 photograph; colour; 4 x 5 in. Coffee party at the I.O.D.E.’s 2nd Appearance Shop in Grande Prairie. Members include (back row L to R): Bette Norton, Marie Lobb, Marie Remple, Ann Watson, Kate Higginson, Freda Jebb, Wendy Parks and Ella Simpson, and (front row) Jeri Jenson and Fay Bacon. I.O.D.E. members carry in flags at the 1982 I.O.D.E. Provincial Convention. Sandy Boyd, Eileen, and Lorraine Rohne at a quilting session at Louise Robinsons’. Alberta Delegates at the National I.O.D.E. meeting in St. Andrews By the Sea, New Brunswick. Grande Prairie I.O.D.E. members include Jessie Card and Vi Patterson. Rescue Baby donated by the I.O.D.E. to the Grande Prairie Hospital. The Albertan I.O.D.E. members at 84th National Annual Meeting at Victoria’s Empress Hotel. Public Library Donation, 1985 c.
Librarian Amy Soltys and I.O.D.E. member Marg Longmate. 1 photograph; colour; 5 x 8 in. An I.O.D.E. convention. Grande Prairie member, Marg Longmate, is third from the left in the back row. Burk Strelke, Grande Prairie Regional College regestrar, presents student David Yue with an I.D.O.E. scholarship. I.O.D.E. members Jessie Card and Marie Lobb sell tickets at the Co-op for a raffle whose proceeds went to Camp Tamarac. 2nd Appearance Shop, 1987 c.
The I.O.D.E.’s second hand clothing store, 2nd Appearance Shop, on the south side of 99th Avenue. The store was not only a social benefit but was a mainstay for many years allowing the group to finance health, education and social programs. I.O.D.E. members, Billie Ford and Violet Patterson, presenting the proceeds of the I.O.D.E. quilt raffle to the Queen Elizabeth II Hospital representative Diana Gitzel. Members from Grande Prairie’s I.O.D.E. and their donation of new wind socks at the Wind Garden. Queen Elizabeth II Donation, 1985 c.
I.O.D.E. members, (back row L to R) Dorothy Beattie, and Marie Lobb, and (front row) June Daw, Liz Usher and Marlene Chababa, at the Queen Elizabeth II cancer clinic.